News of 150 Years Ago–May/June 1859 « The Turner Brigade--Missouri Volunteers, U.S.
By the late 1850s, Henry Shaw had become one of the wealthiest men in St. Louis, his fortune being estimated at somewhere between 1½ and 2 million dollars. With the personal comfort that his wealth afforded him, Shaw had left the business of hardware and real estate speculation behind him, concentrating only on the expansion of his garden and of Tower Grove Park. Sometime in 1856 he met a woman named Effie Carstang. Born in 1820 in New York, Effie had come to St. Louis by way of Charleston, SC. She was residing with her sister, Mary Seaman, in a boarding house on Fifth St., between Franklin and Morgan Aves. She was soon introduced to Mr. Shaw and, seemingly, the two hit it off. According to Shaw, he wanted to teach Effie about botany. As time went on he and Effie, according to the accounts of others, began to spend a lot of time together, with Shaw loaning her money on at least two occasions, and even giving her the gift of a piano. According to Effie, Shaw proposed marriage to her sometime in November 1856. She accepted. According to Mary Seaman, a date for marriage was soon set for sometime in August 1857. It seems that Shaw soon had misgivings about the impending marriage. It is alleged that he began putting it off, and he eventually took back the piano, saying that he needed it for a party at Tower Grove, his estate which bordered the garden. 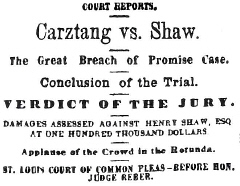 On July 19, 1858, Effie Carstang filed suit against Henry Shaw in the Court of Common Pleas of St. Louis County. Effie was suing Henry for breach of promise, asking for $20,000 in damages. Shaw soon filed a counterclaim of $200, claiming that he had twice loaned Effie $100, each time obtaining a signed promissory note that she would reimburse him. The money was never paid back. On December 14, 1858, Effie revised her suit, asking instead for $100,000 in damages. From The Missouri Democrat, Friday, June 3, 1859. The Great Breach of Promise Case. AT ONE HUNDRED THOUSAND DOLLARS. Applause of the Crowd in the Rotunda. ST. LOUIS COURT OF COMMON PLEAS – BEFORE HON. Yesterday morning a larger crowd than ever collected in the Rotunda long before the opening of Court. When the doors were opened the scenes of the past few days were renewed, and the room was speedily crammed full of human beings. Hundreds unable to obtain admittance were obliged to leave. At a quarter before eleven, Judge Bates commenced his concluding remarks for the defence, and finished at a quarter past twelve. Major Wright then summed up the case in a speech of two hours and three quarters in length, which is universally pronounced as one of the most effective and eloquent speeches ever made by the distinguished advocate. At its conclusion the court room resounded with the applause of the vast crowd by stamping of feet and clapping of hands…. Starting in 1837, representatives of Southern states held Southern Commercial Conventions, with the aim of promoting economic development in the South. Despite these meetings, the South lagged further behind the North in population growth, industrialization and railroad construction. By the late 1850s, the conventions became dominated by Fire-Eaters, those most fervently pro-secessionist. The last meeting was in May 1859 in Vicksburg. From The Missouri Democrat, Thursday, May 19, 1859. THE VICKSBURG CONVENTION-PIRACY, DISUNION AND FILIBUSTERISM ENDORSED. By an inspection of the columns of the Vicksburg Sun, we have made ourselves somewhat acquainted with the animus and purposes of the late “Southern Commercial Convention.” As an organ for the expression of Southern feeling, this assembly may justly claim the notice of the press. The States of Alabama, Arkansas, South Carolina, Louisiana, Texas, Georgia, Mississippi, Florida and Tennessee were represented in it. The delegations, we presume, were all appointed by the Governors of these States. The Convention was, therefore, a regularly constituted representative body, and its sayings and doings are entitled to some attention. We cannot characterize the spirit by which it was animated in soberer terms than to say it was lawless and revolutionary in the extreme…. St. Louis today is suffering from sharp cuts in public transit. In 1859, public transit was a novelty, as horse-drawn streetcars were just being introduced in the city. Even then, what is now called “transit-oriented development” was growing the city along the new routes, much as development has occurred along the MetroLink light rail lines today. From The Missouri Democrat, Thursday, May 12, 1859. Among the already visible results of the projected City Railroads, is a remarkable increase in the value of suburban property. The recent sales in Carr’s Addition showed and increase of twenty per cent on the estimated value of that property, and a much larger increase on previous prices. This is attributed by good authorities to the projected horse railroad on Morgan street and Franklin avenue. It is well know that exterior property in New York and Philadelphia ascended to a very high figure on the completion of the horse railroads in those cities. Though it is manifest that the same causes must produce the same results in St. Louis as elsewhere, yet it is highly satisfactory to find these welcome results appearing so soon. Railroads, albeit worked by horse power, shorten the distance between the centre and circumference, thus bringing the outlying quarters of the city into close approximation with the great central marts and thoroughfares. Nor will the increase in the value of property consequent upon the construction of horse railroads be limited to the suburbs. All the intermediate points will be benefitted in the same ratio. The advantages will be common to all the localities which the lines touch or border upon. Hence, we expect to see a large additional development of business and trade on Franklin avenue, Morgan street, Olive street, Broadway, Fourth street-in short on all the street with which the lines will be coincident or to which they will be contiguous. Being easier of access in all seasons and at all times, greater number of persons will visit them. The state of the weather or the pavements will deter no lady from going out to shop when she will be able to go from any one place to another and back again without inconvenience. The retail trade especially will experience the good results of these improvements in city travel. Being buried alive was a recurring theme in a number of works by Edgar Allen Poe, which no doubt increased public fear of this inadvertent practice during the mid-19th century. And what the public fears, the newspapers write about. From The Missouri Democrat, Tuesday, May 3, 1859. A singular occurrence, says the Albany Knickerbocker of the 27th, was discovered in a vault attached to one of our burial grounds on Sunday last. It was that of a female, who was deposited therein for dead some two months since, being found, on opening the coffin, to be lying on her side with one hand under the head. From this it was evident that the woman was alive when placed there, and awakening from the trance into which she had fallen, endeavored to extricate herself from her entombment. This, of course, was an impossibility; the cover was not only screwed down tightly, but the space was too contracted to allow of even an effort. It was evident, however, that the unfortunate woman became convinced of this fact, and concluded to die. She therefore took the easy posture in which she was found, and breathed her last. The thought that they had buried her while yet alive, set her friends almost crazed. The body was that of a woman who formerly resided in the Bowery. The father and mother of the deceased had just arrived from the old country last week, and were brought to the vault to see their child. The scene is related as heart-rending. This is another instance of too hasty burial. We have often heard of similar cases to this in other parts of the country, but none in this neighborhood. Newspapers today are often accused of printing company press releases as news. The following article suggests maybe this has been going on for a long time. From The Missouri Democrat, Friday, May 20, 1859. Sharps’ Patent Breech Loading Rifles, Carbines and Shot Guns. A permanent agency has at length been established in this city for the sale of this celebrated fire-arm. The agent is H. M. Woodward, at No. 13 South Main street. The articles here are necessarily a limited selection. What if you could look at an entire newspaper of the period for one day? What kind of other stories would be printed? The DEMOCRAT did just that in a single article, based on a paper that it had received from another state. Some of it sounds a little like the National Enquirer. From The Missouri Democrat, Wednesday, June 29, 1859. Fiendish attempt to set fire to a steamboat. Water-spout and destruction of life. Meteor. A living insect cut out of a man’s belly…. Every paper has fillers, short articles that fill out a column. Here are a couple from June 1859. From The Missouri Democrat, Thursday, June 30, 1859. There is many a sermon, says Beecher, that has altogether too much ornamentation for good. If I recollect right, there is never an urchin that is to be whipped who would not prefer that all the leaves should be left on the stick. But those who have experience know that if you want to make the child tingle, you must strip off the leaves.